Why choose Kentucky Science Center for your next gathering? Located on beautiful historic Main Street in downtown Louisville, the Science Center offers: a panoramic view of the Ohio River; convenient parking; Wi-Fi and AV capabilities; three floors of fun for all ages; and versatile spaces to suit the unique needs of your special event—all of the elements you need to generate a great reaction. For more information please call 502-560-7141 or simply click the button below. Kentucky Science Center offers a number of different packages and enhancements to ensure that your wedding is everything you’ve envisioned. Packages include reception, ceremony, or both. Enhancements like hanging paper lanterns, liquid nitrogen ice cream demonstrations, and a 15×15 dance floor take the stress out of planning. Weekend wedding rental packages start at $2,800. Our sophisticated and dynamic spaces generate offer an unusual backdrop for professional meetings. With room capacities from 35 – 400, complimentary Wi-Fi, and unlimited parking, and more, we happily customize your facility rental to best meet your needs. Meeting rental packages start at $250. The Kentucky Science Center’s 4-story digital theater is available for private rentals and business meetings. Our screen can support slide shows, PowerPoint presentations, video-gaming, movie viewing and other productions. Theater rental packages start at $900. Looking for birthday party information? Click Here! 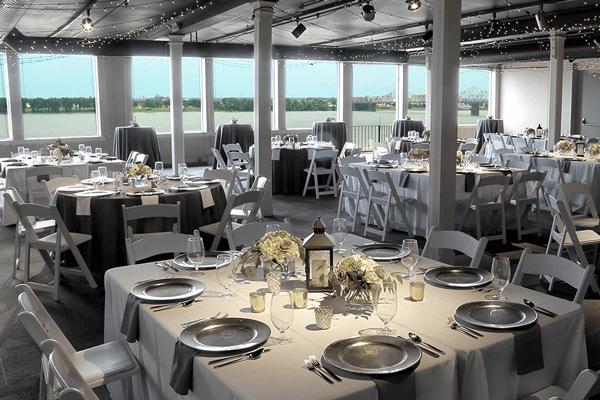 Located on the top level of the Kentucky Science Center, this 5,700 square foot private space is an attractive environment for any event and includes a magnificent view of the Ohio River. Equipped with four built-in, wall-mounted, large screen HD displays (two per room), Kentucky Science Center’s Science Education Wing is ideal for events ranging from business meetings to bridal showers. Our three 1,500 square foot multi-purpose classrooms are the perfect setting for small meetings or seminars. Located in the lower level of the Science Center, these classrooms are completely private. Located on the third floor of Kentucky Science Center, the four-story theater is a beautiful way to screen films, give a dynamic presentation, or hold a panel discussion. Stadium-style seating ensures that everyone has the best seat in the house. We have a list of approved caterers. Contact us for more information!